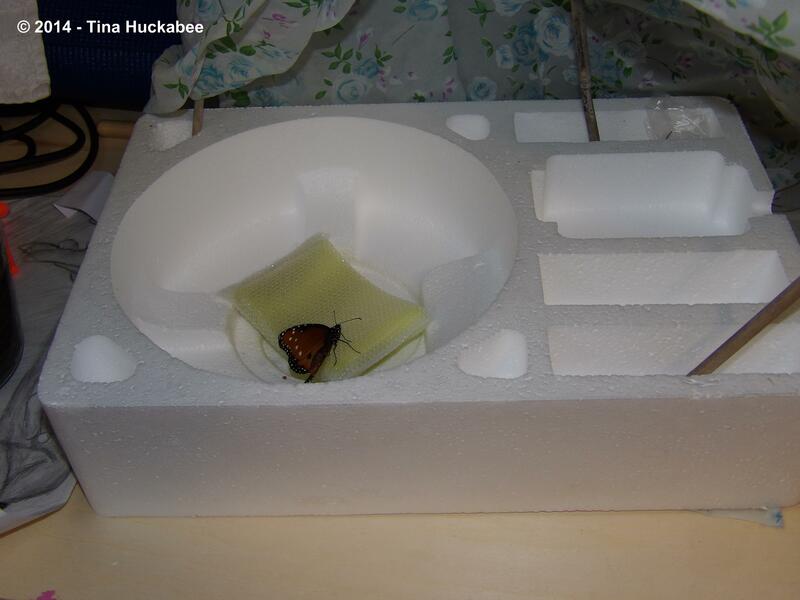 I released the last two Queen butterflies this week. I brought a total of nine caterpillars into my house, mostly Queens, and one Monarch. You can read about why I would do such a thing here and here. 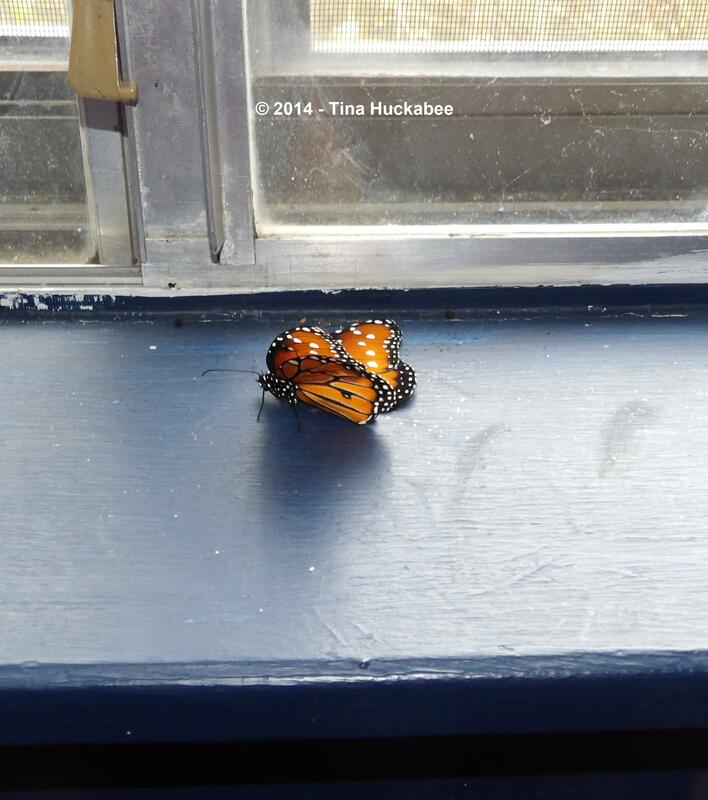 Three of those, all Queens, metamorphosed in the house and at least two, outdoors. Two of the caterpillars died in the larval stage, but I’m not quite sure how many died as chrysalides. I watched all of them for longer than the 10-14 days that is the normative time for the process and decided to remove two stems with four chrysalides to my compost pile, assuming that the very darkened chrysalides were dead. Since I tend to be a rather lazy composter, I don’t routinely dig in new compostable material underneath the old, but rather, I dump on top. In this situation, that was a good thing. 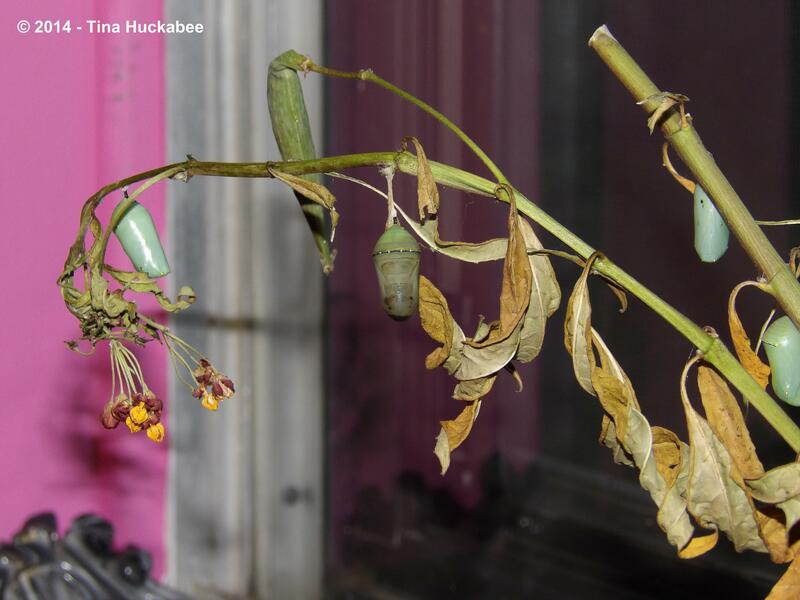 I checked the stems-with-chrysalides, just out of curiosity, a day or two later, and the two chrysalis shells I located were broken–not squishy as if they’d died, but actually broken as if a butterfly had emerged. My hope is that they did survive and emerge. That’s what I’m choosing to believe and there’s nothing like a good rationalization to get through the day. …and two of them were very dark and unhealthy looking, indeed. 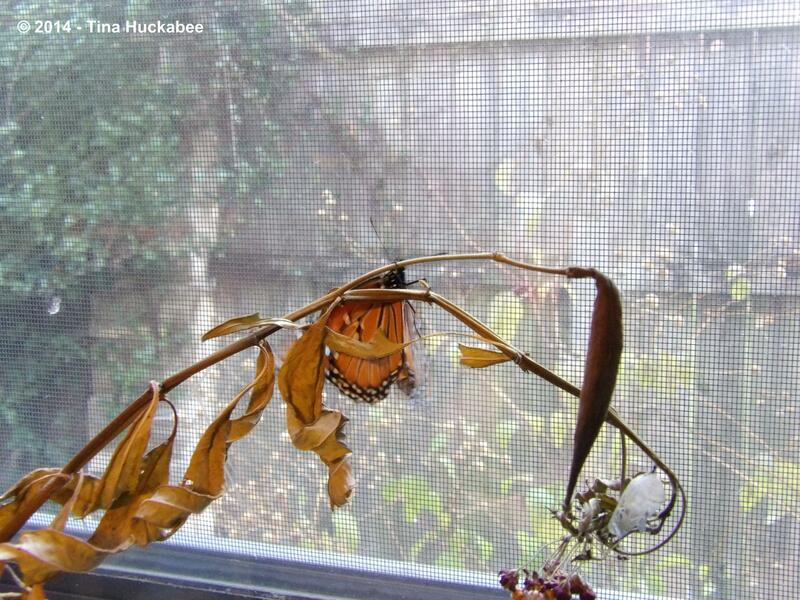 So I pinned my hope on the last two chrysalides, one on a stem and the one above the window. 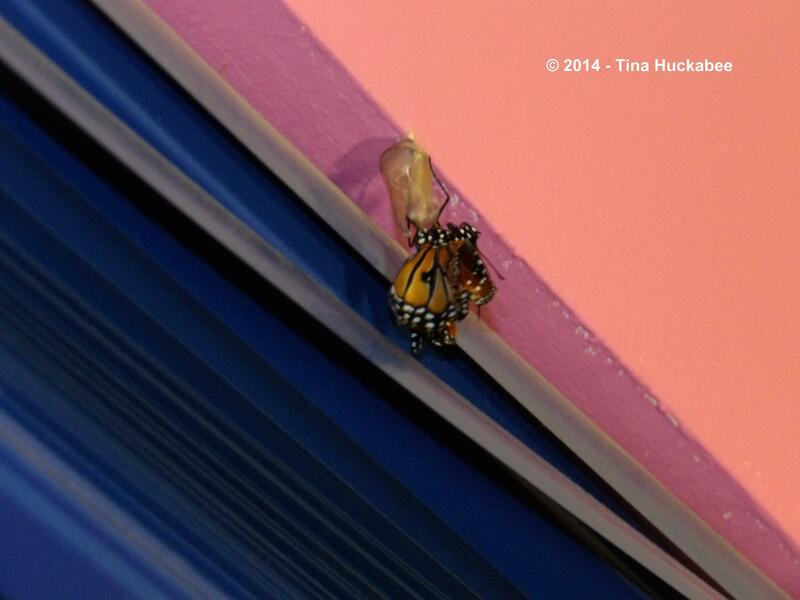 Window chrysalis opened early Monday morning and Sir Queen unfolded from his cozy pupa. Buddha-fly was female, Sir Queen is male. Note the two dark spots on each hind wing? Those are scent spots indicative of a male. 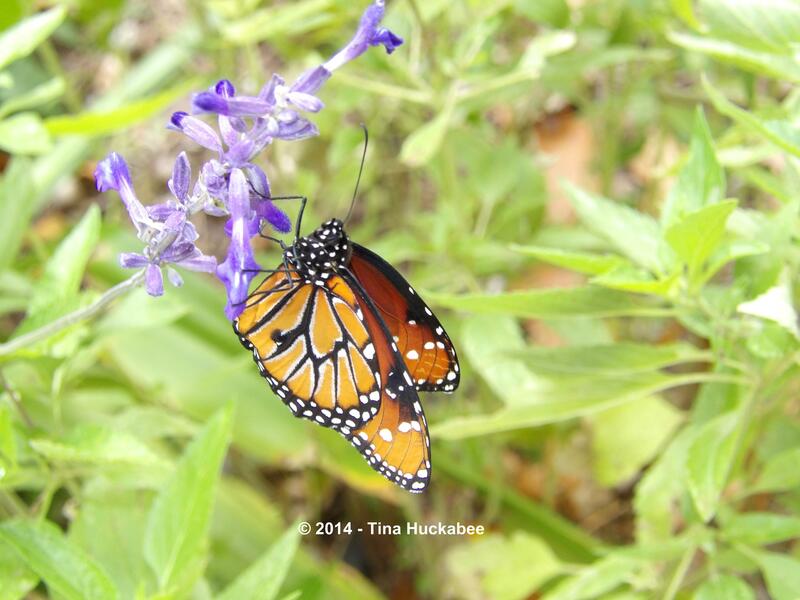 Monarchs sport similar markings–both Queen and Monarchs are in the.butterfly subfamily of Danainae. It was cold earlier this week and I decided not to release him. 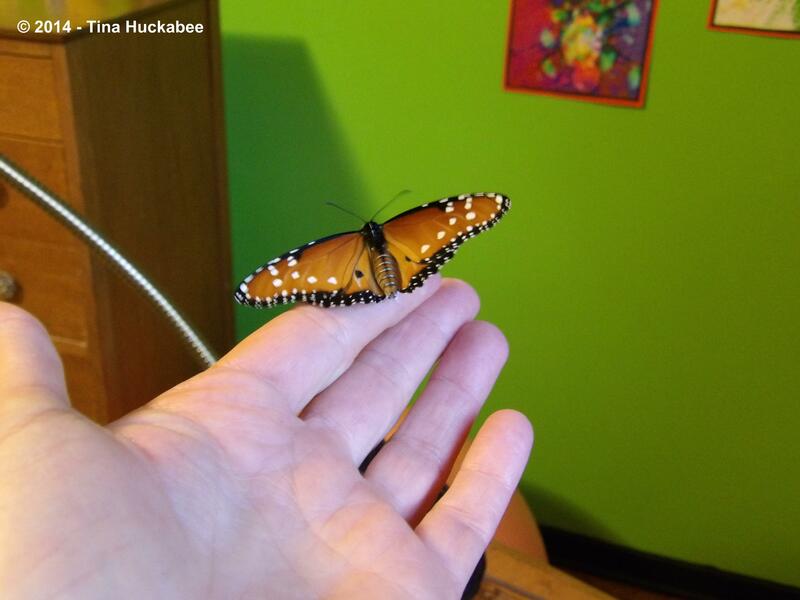 Once I was confident that his wings were dry, I invited him onto my finger and placed him in a protected makeshift butterfly cage–I have cats (the feline sort) so, yeah, I think that was the responsible butterfly nanny thing to do. 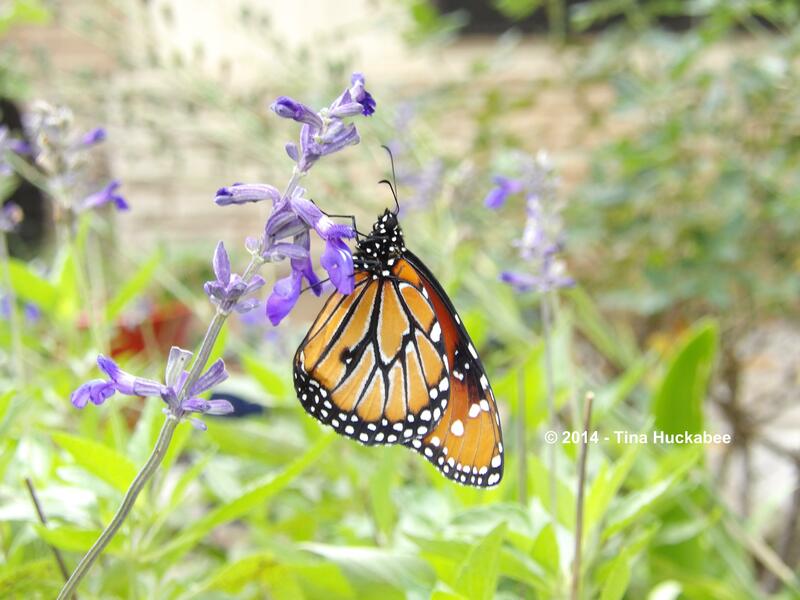 Using instruction from a December 3, 2013 post by Texas Butterfly Ranch, I attempted to feed him, but he never showed interest. Butterflies won’t eat in the first 24-48 hours, but Sir Queen never ate in my presence. It was an instructive and remarkable experience, hosting this handsome fellow and his lady friend the week before. I observed closely his beautiful markings, how he’d turn his head toward me when I was near, and the intricate patterns throughout his wings, thorax and abdomen. 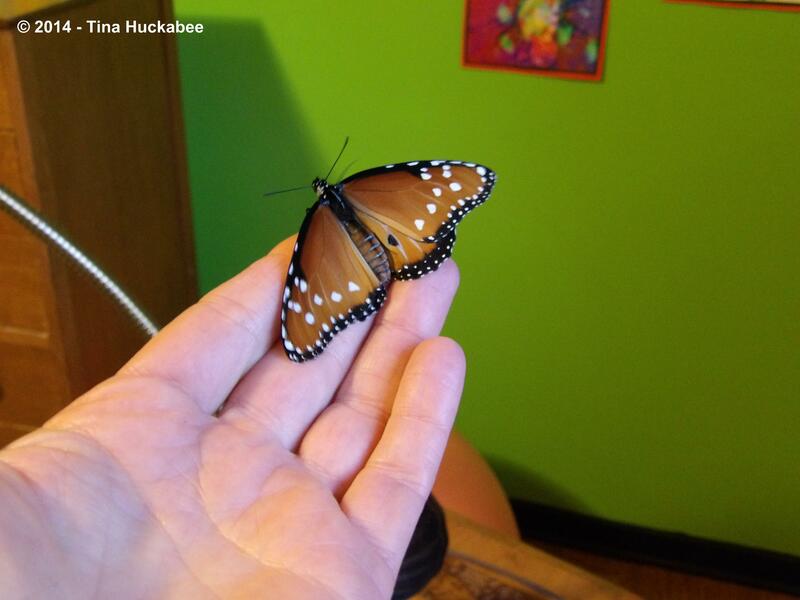 One can’t appreciate a butterfly in nature like this–they fly away! And eat! And do other butterfly related things! Though it continued chilly and cloudy this week, I decided on Wednesday that it was better for him to be out there instead of in here. It was warmer and I placed him on some still blooming Henry Duelberg Sage, Salvia farinacea, ‘Henry Duelberg’. He didn’t seem all that impressed, but there wasn’t much more I could do, except hope he eventually unrolls his proboscis and gets to work, sipping nectar. He was still there when I returned later in the afternoon, not having moved much. 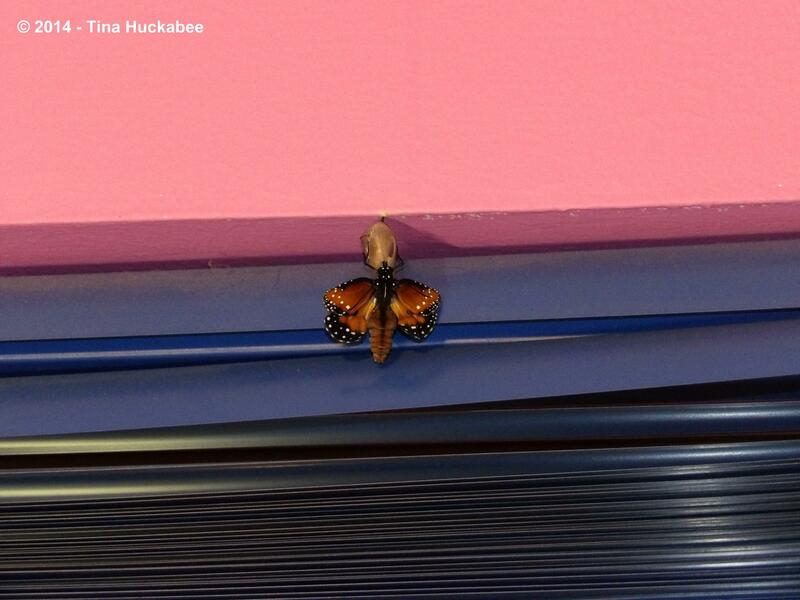 Yesterday afternoon I lumbered into the butterfly room, formerly my son’s room to, ahem, pack up more stuff and…Wow! And a beautiful one at that! I’d noticed that the chrysalis, while darkening, developed clearly defined dots and lines and I wondered if the adult would appear–I’m glad I didn’t banish it to the compost. I quickly ushered him outdoors as it was late in the day. 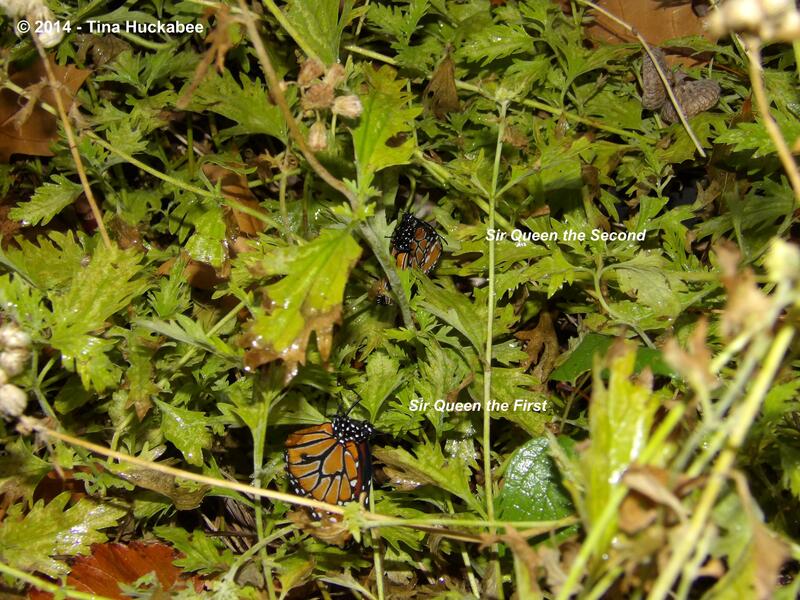 Here they are together in a nice bed of Gregg’s Mistflower–Sir Queen the First and Sir Queen the Second. May both fly high, nectar much, mate with abandon, and prosper. Would I do this again, snatching caterpillars and raising them in the house? I’m not sure. Considering that our weather hasn’t been all that cold, coupled with the questionable survival rate of “my” caterpillars, I wish I’d left them outside to take their chances. Their bodies would have slowed down with the lower temperatures, but they wouldn’t have been disturbed. At least not by me. Maybe they would have become bird food, but that’s part of the cycle. NOT part of the cycle is a crazed, OCD gardener snipping them and their food source out of the garden and plunking them in a room with two bright pink walls and two neon green walls–and a Jimi Hendrix poster. 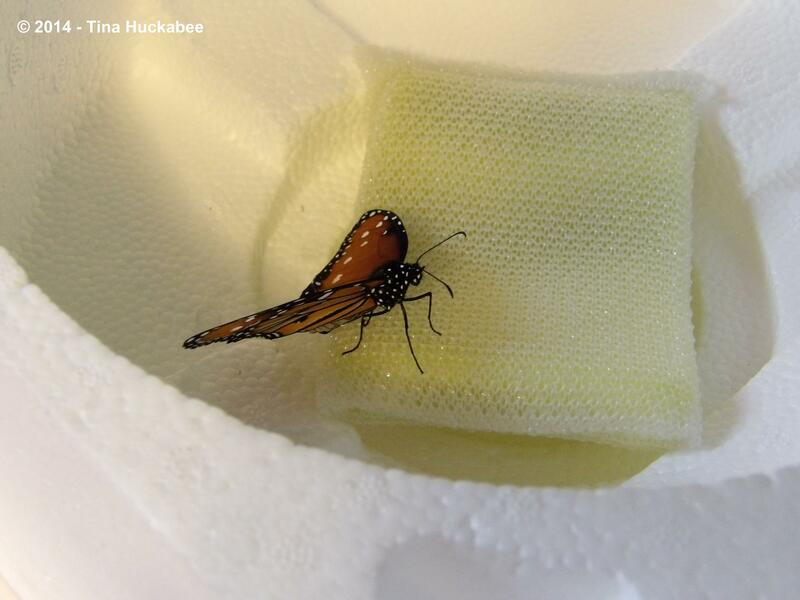 For myself, it was a gift to observe the process so intimately–larvae, pupae, adults. 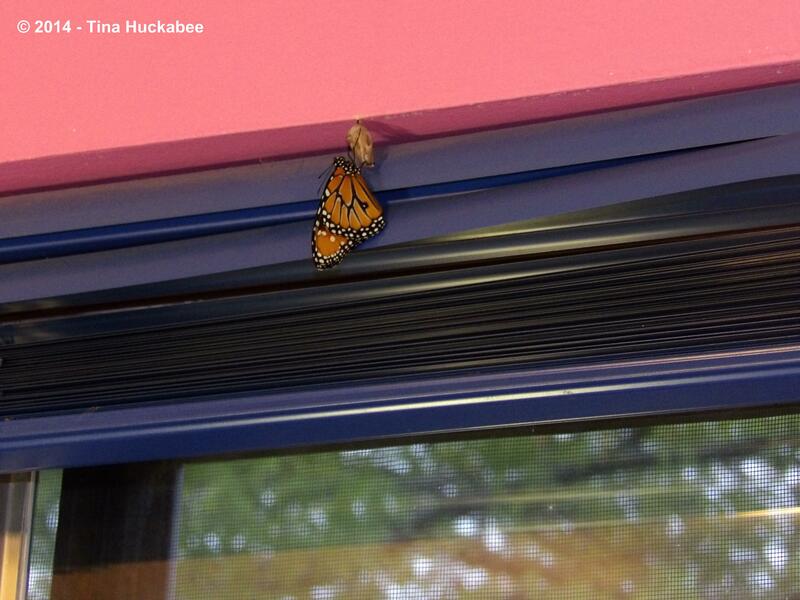 This business of metamorphosis is awesome–in the true sense of that word. The beauty of each stage and the intricate changes throughout–I’m fortunate to have had the time and awareness to witness this common, but remarkable, natural event. Maybe one of the Sir(s) Queen will find Buddha-fly and they’ll cruise off together, wings entwined, into the sunset. 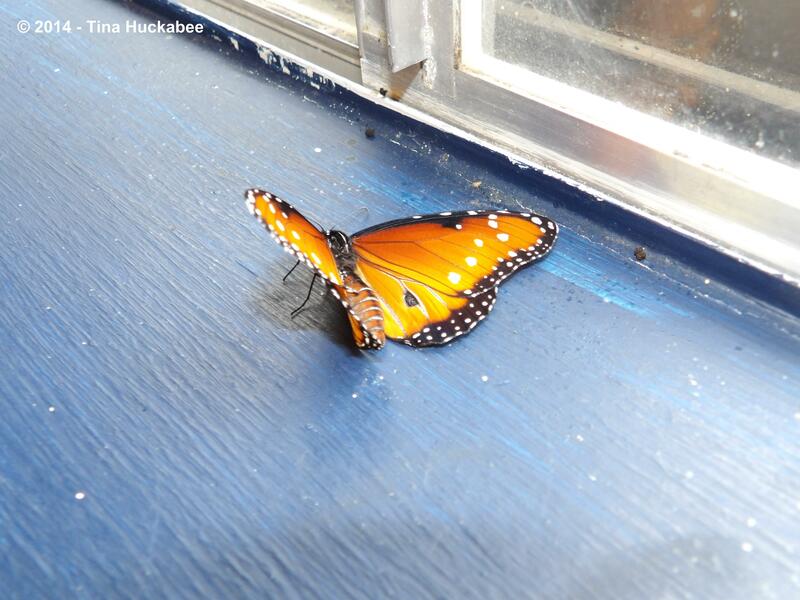 This entry was posted in Danaus gilippus, Queen butterfly, Uncategorized and tagged Danaus gilippus, Queen butterfly by Tina. Bookmark the permalink. To demonstrate what a total nerd I am, I kept thinking, while reading this post, of Star Trek and their Prime Directive to never interfere with an alien culture’s development. This has been fascinating, and my own opinions about the wisdom of butterfly nannying have been shifting around right along with yours as I’ve read about your (and other’s) experiences. I am grateful to you for this chance to have witnessed the amazing process up close, and I’m equally thankful for your candid assessment of the advantages and disadvantages of stepping in to assist Mother Nature. Fly away, Madams and Sir Queens! 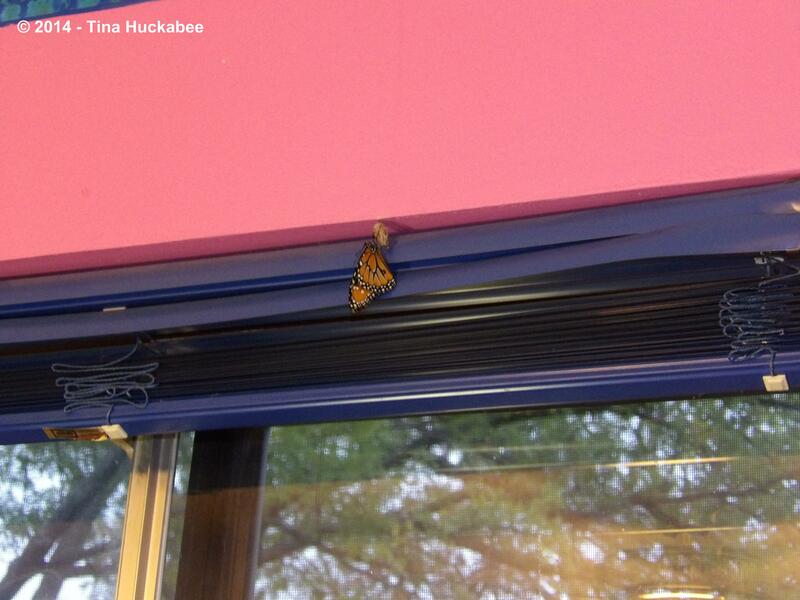 Live long (for butterflies) and prosper! I don’t think I’ll do this again, but I wouldn’t trade the “Up close and personal” that I’ve experienced with the butterfly process. Thank you for reading and support!! 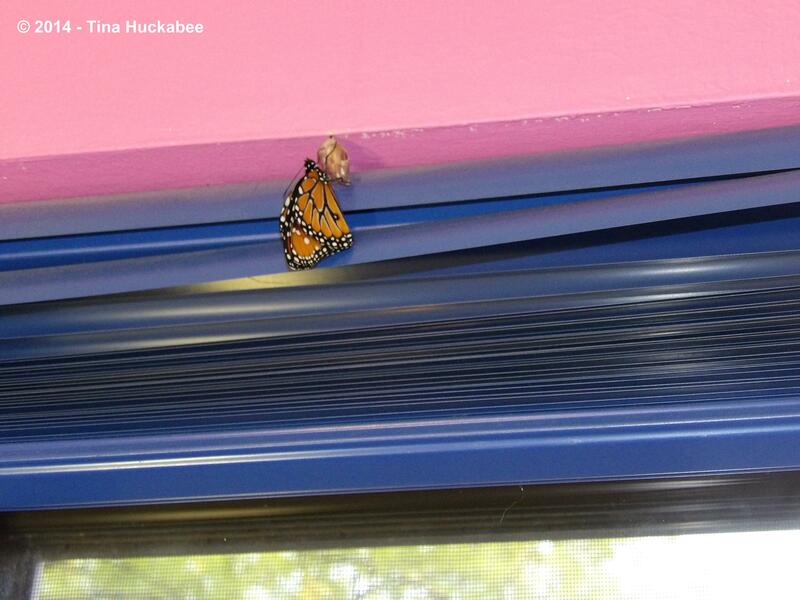 I guess butterflies are similar to bees–its all about the pheromones, or something similar. Who knows. I am betting some chemist somewhere knows and I intend to find out. Oh, no doubt–with both a chemist knowing and your finding out! The whole process has been fascinating and I have enjoyed sharing it with you. Thank you. The chrysalides look like porcelain and the butterflies are so beautiful. You are very welcome, Chloris. 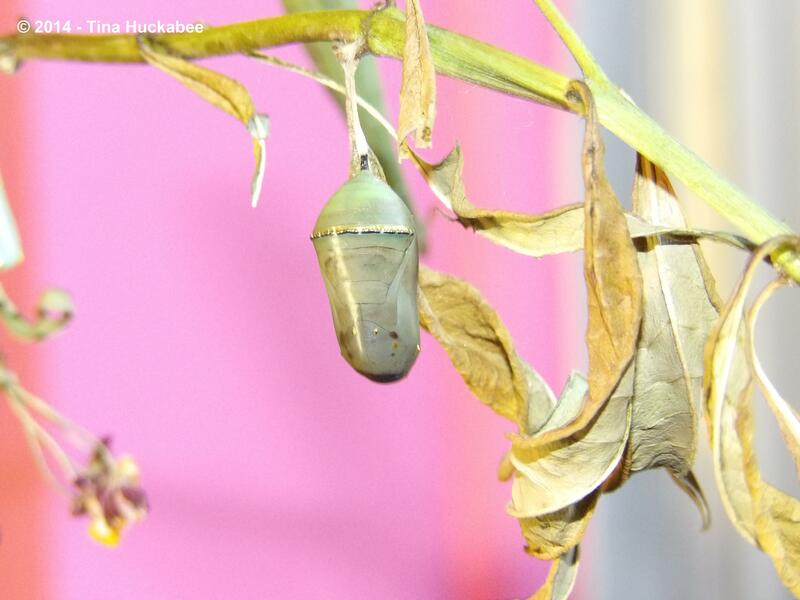 I think all parts of the butterfly are gorgeous–but I agree that the chrysalis is almost jewel or glass like.